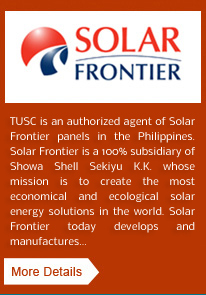 Transnational Uyeno Solar Corporation (TUSC) achieved another important milestone when it successfully completed and commissioned the country’s first-ever purely renewable charging station for electric vehicles in Boracay Island. 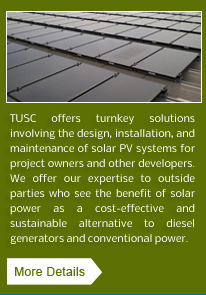 The project, carried out under a partnership among the United States Agency for International Development (USAID), the Climate Change Commission, and the Department of Energy, is a shining testament of TUSC’s commitment to provide clean power and building a sustainable, clean and green world. The project involves a 14 kW battery-backed solar charging station and was formally inaugurated on 19 September 2013. It was made possible through funding from the USAID under its Climate Change and Clean Energy Project. E-tricycles and other electric vehicles (EV’s) have been touted as attractive and ready alternatives to the current modes of transportation that use fossil fuels such as gasoline and diesel. Especially in a tourist showcase such as Boracay Island whose environment needs to be preserved, sustainable transport technologies such as EV’s can significantly reduce air and noise pollution while providing measurable economic benefits to local drivers. EV’s, however, can only realize their full potential as greener alternatives, contributing to zero carbon footprints, if they source their power from completely renewable sources such as solar-based solutions. Indeed, for a sustainable transport to be truly sustainable, it should be powered with renewable energy. 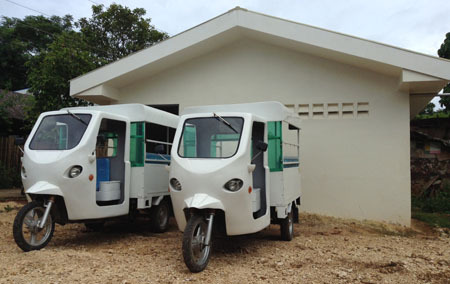 The marriage of EV’s with renewable energy formed the backbone behind the development of the pilot solar charging station for e-tricycles in Boracay Island. 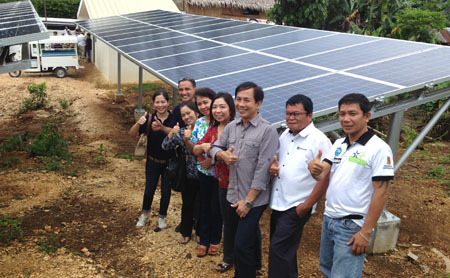 Completed in a span of less than three months, the solar charging station occupies 200 square meters of space in Barangay Manoc-Manoc, adjacent to the headquarters of the Boracay Land Transport Multi-Purpose Cooperative. The cooperative, under the guidance of USAID, shall eventually own, manage, and operate the solar charging station. Requisite trainings and technical capacity building have already been provided by TUSC to BLTMPC to ensure that this pilot system’s benefits can be sustainably enjoyed for the long-term. 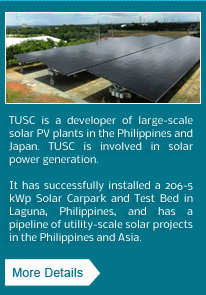 With the completion of this unique project, TUSC now boasts of a diverse portfolio of solar projects that boosts its stature as one of the country’s leading solar-based solution providers. Equipped with its three-pronged value proposition of Track Record and Capability, Cost Performance, and Project Life Cycle Management, TUSC shall continue to be a vehicle of TDG’s vision of becoming truly Global, Great, and Green. Inauguration of the first purely renewable charging station in the Philippines. From L-R: Ms. Jen Tablante, Transnational Uyeno Solar Corporation (TUSC) General Manager; Engr. Greg Lofamia, TUSC Project Implementation Manager; Ms. Divina Chingcuanco, United States Agency for International Development (USAID) Climate Change and Clean Energy Project Chief of Party; Ms. Ruby de Guzman, Department of Energy Division Chief; The Honorable Wilbec M. Gelito, Malay Municipal Vice Mayor; Ms. Leonila Gutierrez, USAID Office of Environment, Energy and Climate Change (OEECC) Energy Policy Advisor; Mr. Joel Gelito, Boracay Land Transport Multi-Purpose Cooperative (BLTMPC) Chairman; and Mr. Noel A. Dimaano, EJeepney Transport Corporation Chief Finance Officer.